A small rope swing with us, want to join ? For those who enjoy rope swings, we organized on a regular basis rope swing in France. It’s a fun time with small swings for those who are not expert and don’t want to get too scared like on the giant rope jump we do for the film. If you want to join, just let us know. It’s not everyday we can watch an epic rope jump with amazing edit ! For your eyes only…. Big up to the team Dream Walker that allowed us to dream. We whish we were there with them. Rope jump and rope swing are very popular these days and many slackliner are doing them. It’s an amazing experience and we enjoy this filling of free fall. But safety first: it’s not something to do without experience. A highline needs experienced people to install it, and it’s the same for swing ropes. 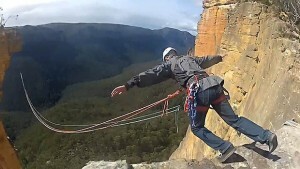 What we’ve learned in this swing rope accident in Australia (Blue Mountains) is that we should always check vertically ! Throw a stone, count same as BASE jumpers do. If a ledge is on the way, make sure you can clear it before jumping. Luckily here, the accident ended a good way eventhough legs got broken. Be safe and analyse first !